← Photo of the missing pyramid….Do you know where it is now? 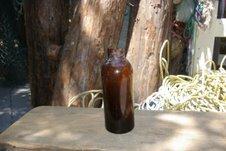 Did a rough & tumble lumberman sip from this historic bottle? One of the more interesting things Meg and I found during our exploration of the Gazos Creek watershed yesterday was this old bottle. Because of its location I assume somebody had found it while bushwhacking and abandoned it because it was broken. Being more interested in cleaning up litter then collecting antique bottles, I packed it out. Doing a little Internet research, I discovered it was a pre-Prohibition beer bottle made by the William Franzen and Son bottling company in Milwaukee, Wisconsin. Its cachet for me is that it was possibly drunk in the heyday of logging in the Gazos Country in the early 1900s by one of the characters in Edward Conant’s or Harvey Mowry’s, books that I’ve mentioned previously. The following article was first published in its entirety in February,1997 as part of the book: “The Milwaukee Antique Bottle & Advertising Club: The Cream City Courier – A Special 25th Anniversary Issue” compiled & edited by Michael R. Reilly, then, Editor of The Cream City Courier. The book was privately published by Mr. Reilly. “In 1900 Franzen became owner, reincorporated, and placed his own mark on the bottles. Things were at a low ebb when Franzen took over but by 1898 the capital stock had risen in value from $10,000 to $100,000 and by 1900, thanks to the use of a tank furnace and semi-automatic machines, to $300,000. Use of a higher percentage of cullet in the batch aided in partial reduction of operating costs. Bottle quality was good, and the factory’s most important customers, the Milwaukee brewers, had reentered the fold. This entry was posted in Historic Bottles, John Vonderlin. Bookmark the permalink.